Azeb feels it is important to cook with healthy, whole foods. “My children eat at this restaurant. This is the food I feed my family, of course I want it to be made of the best ingredients possible.” Azeb has taken care to choose the best cookware as well. Rather than using the cheaper aluminum cookware she chose all stainless steel to avoid any concerns about aluminum’s potential contribution to Alzheimer’s disease. She takes the health of her patrons seriously. 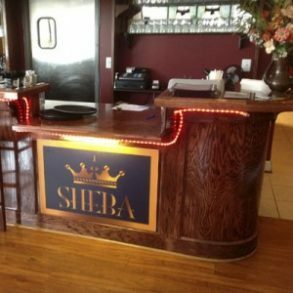 One of the stand-out features of Sheba’s is that it departs from the traditional Ethiopian practice of overcooking its stews. Azeb appreciates the growing scientific evidence that much of the nutrition is lost in the cooking process. 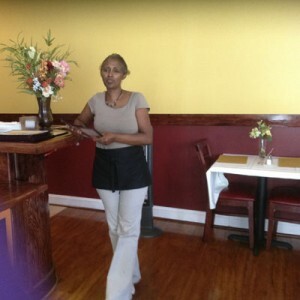 She takes pains to assure her vegetables remain as whole as possible while retaining their authentic Ethiopian flavor. 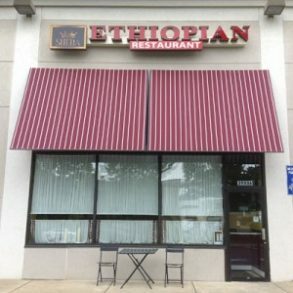 “Ethiopian’s are learning not to overcook their food. More and more Ethiopians are adopting healthier practices,” she says. Azeb is passionate about food and its relationship to community. She describes life in her native Ethiopia with nostalgia. “In Ethiopia, community is all about food. Everyone eats together. Everyone feels a responsibility to feed the children of the community.” She does very little advertising and is delighted to discover the support she has received from the Fairfax community. Word of mouth is best advertisement and the word is getting out. 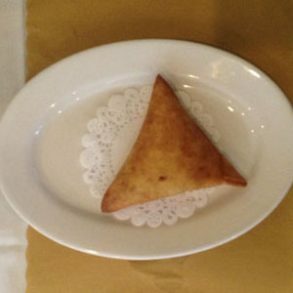 As an appetizer, Rich and I ordered the Samboussa, a crisp lentil stuffed pastry which is pan fried and served warm for $3.95. 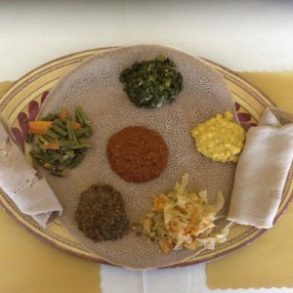 For the main course, we ordered the vegetarian combination platter for $12.95 which consisted of spicy red lentils, mild lentils, yellow split peas, collard greens and onions, cabbage and carrots cooked with onions, and green beans and onions. 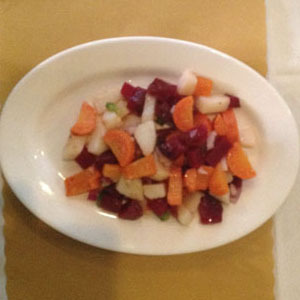 As a side we ordered the beets, carrots and potato salad tossed with Sheba’s house dressing and served cold for $4.95. A popular vegan dish, which we didn’t try is tomato fit-fit, a mixture of tomatoes, onions and jalapeño peppers chilled with a lemon berberé sauce for $5.95. We enjoyed everything we tried, finding it all delicious and satisfying. We left Sheba’s with an empty plate which looked as though it had been licked clean, it was that good. For your carnivorous friends and family, there is plenty to choose from, so don’t despair. 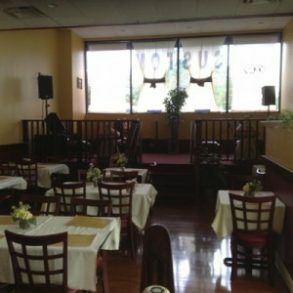 There is a variety of menu items to suit the most finicky palate at Sheba’s Ethiopian Restaurant. Sheba’s is located in Fairfax on between Interstates 66 and 495. It is near exit 57A on I-66 and exit 52A on I-495. 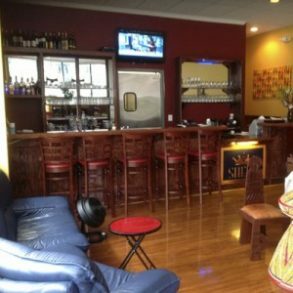 Please keep in mind we photograph the restaurants we review during slow periods so as not to disturb patrons as well as to give you a better view of the restaurants themselves as opposed to crowds of diners.